This elegant Monarch Specialties manufactured wood filing cabinet will compliment any office with style and function. Constructed with manufactured wood to keep your important documents safe and organized. Get organized and avoid paper clutter with this filing cabinet. 3-Drawer Manufactured Wood Filing Cabinet in White This elegant Monarch Specialties manufactured wood filing cabinet will compliment any office with style and function. Constructed with manufactured wood to keep your important documents safe and organized. Get organized and avoid paper clutter with this filing cabinet. 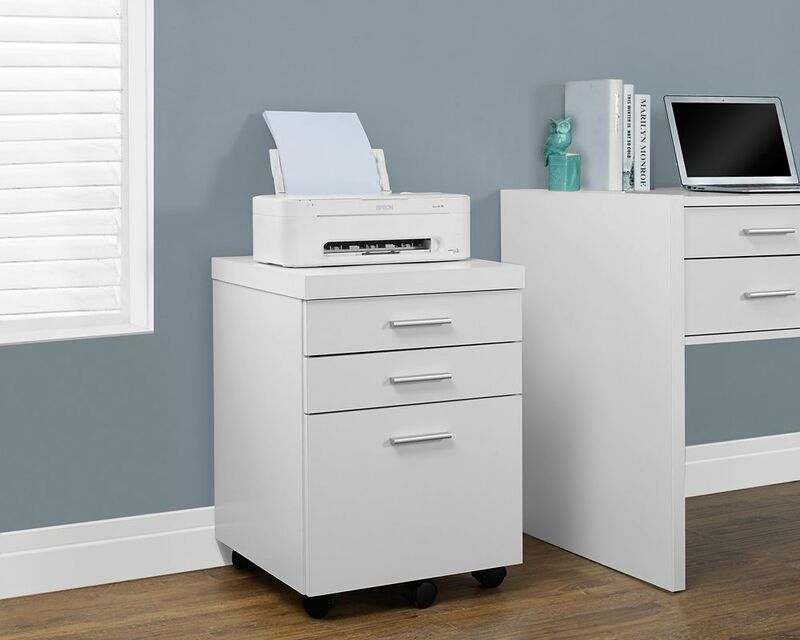 3-Drawer Manufactured Wood Filing Cabinet in White is rated 5.0 out of 5 by 4. Rated 5 out of 5 by TheresaM from I love this cabinet! It perfectly matches the desk I... I love this cabinet! It perfectly matches the desk I purchased for the small workspace in my living room. The bottom drawer is very roomy and will hold lots of files. Rated 5 out of 5 by ktkanuck from The instructions were straight forward and easy to follow. It did take a while, though, as with t... The instructions were straight forward and easy to follow. It did take a while, though, as with the unit having three drawers to put together, there were lots of parts and pieces to assemble. All were clearly marked. One thing that I didn't appreciate from the online photo is that the file drawer has a wheel at the front that keeps the drawer level as one pulls it out. Overall, I am pleased with the product and it will suit my needs perfectly as it will be the drawer unit for the Murphy style bed with desktop that I am installing in my office/guest room. When I have guests, the desk will disappear when the bed comes down, and I will be able to wheel this unit out to another location, keeping my private files private.